Former President Olusegun Obasanjo recently criticised the Independent National Electoral Commission (INEC) for allowing supplementary election in parts of Osun State during the September 2018 governorship election. The former President was of the view that the rerun was not necessary, claiming that a winner had emerged in the first round. Assistant Editor LEKE SALUDEEN sought opinions of Nigerians on Obasanjoâ€™s comment. Some lawyers said the former President should have taken time to read and understand the rules guiding the Independent National Electoral Commission (INEC) in declaring an election inconclusive. According to them, INECâ€™s decision on the matter was based on extant law and its guidelines and regulations. They said the electoral umpireâ€™s decision on elections cannot be influenced by public opinion. A Senior Advocate of Nigeria (SAN), Emeka Ngige, said INECâ€™s decision to order a rerun in the Osun governorship election was appropriate. He said if the electoral umpire had gone ahead to declare a winner, the tribunal could have nullified the election on the basis that some voters were disenfranchised. He said it would have been wrong to declare a winner, when voting did not take place in some places. Ngige said apart from Anambra, other precedents were set in Imo and Kogi in previous elections. He recalled that there was a rerun in one local government in Imo State in 2015, when the exercise was disrupted by violence. He added: â€œEven though Governor Rochas Okorocha had gotten the required number, INEC refused to make a declaration in his favour.â€ He said Okorocha went to the Federal High Court to stop INEC from conducting the rerun, but the court refused to grant any injunction. The rerun took place and Okorocha won. Another lawyer, Jibrin Okutepa (SAN), said the 2018 governorship election in Osun State was not the first time INEC would declare an election inconclusive. Besides, he said the electoral umpire had judicial approval from the Supreme Court. Okutepa cited the case of James Faleke versus INEC that arose from the November 2015 governorship election in Kogi State. He said: â€œIn that case, Chief Wole Olanipekun (SAN) led me and other eminent senior lawyers to argue that the reliance by INEC on its manual for election was unconstitutional, because the constitution has already set out the parameters on how and when a governor should be declared elected in Nigeria. â€œWe argued that as at the time INEC declared the result of Kogi State governorship election inconclusive, the late Prince Abubakar Audu and James Falake had won the required spread and majority of lawful votes. There was no necessity for the rerun in the polling units whose results or elections were cancelled. A law teacher, Mr Wahab Shittu, agreed with Okutepa, saying the declaration made after the Osun governorship election was not new. He said: â€œMy position is that the decision in Faleke versus INEC upholding the right of INEC to declare elections inconclusive, relying on constitutional provisions, the provision of Electoral Act, guidelines of INEC inclusive of its manual as quoted in the Falekeâ€™s case remain a good law. â€œIf INEC is vested with powers to conduct elections, it should retain incidental powers to follow constitutional provisions and its own established guidelines. Section 179 (2) (a) (b) of the 1999 Constitution (as amended) provides, A candidate for an election to the office of governor of a state shall be deemed to have been duly elected, where there being two or more candidates: (a) he has the highest number of votes cast at the election; and (b) he has not less than one-quarter of all the votes cast in each of at least two-thirds of all the local government areas in the state. â€œSection 53 (2) of the Electoral Act 2010 provides: Where the votes cast at an election in any polling unit exceed the number of registered voters in that unit, the result of the election for that unit shall be declared void by the commission and another election may be conducted at a date to be fixed by the commission where the result of that polling unit may affect the overall result in the constituency. Shittu added: â€œHowever, Section 69 of the Electoral Act provides: In an election to the office of the president or governor, whether or not contested and in any elective office, the result shall be ascertained by counting the votes cast for each candidate and subject to the provisions of Sections 133, 134 and 179 of the Constitution, the candidate that receives the highest number of votes shall be declared elected by the appropriate returning officer. Shittu said there was disruption of the election in three polling units in Orolu Local Government, which have a combination of 947 voters; in Ife South Local Government, where there was malfunction of Smart Card Readers in two polling units, which affected 1,314 voters; in Ife North, over-voting affected 353 voters in a polling unit and in Osogbo local council, there was no voting in a polling unit that has 884 votes. The Osun APC spokesman, Mr Kunle Oyatomi, said it was a pity that Obasanjo was using the privilege of his position to express an opinion that was subjudice to a case already in court. Oyatomi said the opinion expressed by the former President at this stage is not only unlawful, but a glaring disrespect for the rule and process of the law. The APC Director of Publicity, who is a lawyer by profession, said: â€œThis is more so because Obasanjo is using that case which is still disputed to illustrate unfairly his allegation that INEC cannot be trusted to run a free, fair and credible presidential election in February. We advise Chief Obasanjo to limit his comment on a matter that is subjudice, otherwise he would be laying a precedent that would be unhelpful to the rule of law. â€œUnder our electoral law and provisions of our constitution, INEC has the function of conducting all elections in the country. And it is also empowered to declare an election valid or invalid, if there are sufficient lawful reasons to do so. The INEC National Commissioner and Chairman, Information and Voter Education Committee, Prince Solomon Soyebi, said the decision to have a rerun in Osun governorship election was based on extant law and INEC guidelines and regulations. Soyebi said: â€œThe Returning Officer, Prof. Joseph Fuwape, has communicated to the commission his inability to make a return in accordance with the legal framework and INEC guidelines. This was as a result of areas where results were cancelled; there was no voting or there were disruptions. In all, 3,498 voters could not vote in seven polling units spread across four local government areas. â€œBased on the results collated by the returning officer, the margin between the two leading candidates is 353 which is slower than the number of registered voters in the affected areas. Extant law and INEC guidelines and regulations provide that where such a situation occurs, a declaration may not be made. 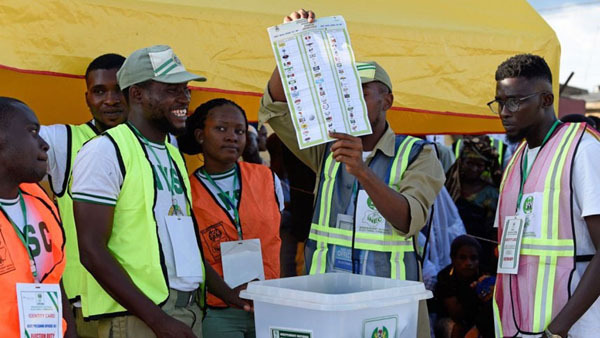 â€œIn the light of the foregoing, the commission met and decided that it will remobilise and return to the affected polling units on Thursday, September 27, 2018, conclude collation and make a return.â€ The commissioner said it was only the votes of the electorate in Osun State that determined the winner.